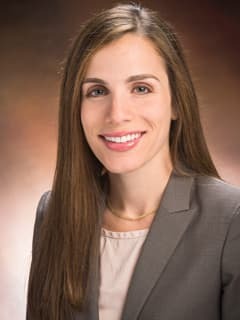 Adva Buzi, MD, is an attending physician in the Division of Otolaryngology (ENT) and the Balance and Vestibular Program at Children’s Hospital of Philadelphia. Mulvey CL, Rizzi MD, Buzi A: Predictive ability of bedside nasal endoscopy to diagnose invasive fungal sinusitis in a pediatric population. Int J Pediatr Otorhinolaryngol. 2018 Dec;115:82-88. doi: 10.1016/j.ijporl.2018.09.019. Epub 2018 Sep 19. 1. Buzi A, Coblens OM, MacGillivray M, Elden L: The use of noninvasive positive pressure ventilation following pediatric tonsillectomy. Otolaryngology-Head and Neck Surgery 157(2): 297-301, Aug 2017 Notes: Epub 2017 Apr 18. Friedman AB, Guillory R, Ramakrishnaiah RH, Frank R, Gluth MB, Richter GT, Dornhoffer JL. Risk analysis of unilateral severe-to-profound sensorineural hearing loss in children. Int J Pediatr Otorhinolaryngol. 2013 Jul;77(7):1128-31. Gluth MB, Friedman AB, Atcherson SR, Dornhoffer JL. Hearing aid tolerance after revision and obliteration of canal wall down mastoidectomy cavities. Otol Neurotol. 2013 Jun;34(4):711-4. Friedman AB, Gluth MB, Moore PC, Dornhoffer JL. Outcomes of cartilage tympanoplasty in the pediatric population. Otolaryngol Head Neck Surg. 2013 Feb;148(2):297-301. Buzi A, Rizzi M: Pediatric Otolaryngologic Considerations. Pediatric Oculoplastic Surgery, 2nd ed. Katowitz JA, Katowitz WR (eds.). Springer Publishing, Co., New York, NY, Page: 169-182, 2018. Mulvey C, Rizzi MD, Buzi A: "Microbiology of Pediatric Complicated Acute Rhinosinusitis" Oral presentation at ASPO Summer Meeting: Frontiers in Pediatric Otolaryngology, Vail, CO July 2018 Notes: Accepted via abstract; Mulvey lecturer. Kiell E, Rizzi M, Buzi A: "Management of Orbital Complications in the Pediatric Patient with Acute Rhinosinusitis: Ten Years of Experience at a High Volume Children's Hospital" Poster presentation at the Annual Meeting of the American Society of Pediatric Otolaryngology/COSM, National Harbor, MD April 20-22 2018 Notes: Accepted by abstract. Mulvey CL, Rizzi MD, Buzi A: “Predictive Ability of Bedside Nasal Endoscopy to Diagnose Invasive Fungal Sinusitis in a Pediatric Population” Oral presentation by Carolyn Mulvey, MD at the Annual Meeting of SENTAC, Toronto, ON, Canada. December 2017. Notes: Accepted by abstract.